But first off, happy Fathers Day! If it was not for our Dads out there who get the hay, unload the hay, build the fence for our first horse or pony, stay up all night walking your poor colicing horse, if it was not for our Dads our horsey world would be so hard. So once again Happy Fathers Day! Larry was enjoying his Father’s Day at the rescue, Jason was spending his Father’s Day sick in bed, poor guy. Jason has a double ear infection, is on 2 antibiotics and has about 10% of his hearing left. Let’s hope that is not permanent. It was hot and it was decided that Parcy could use a bath and since there were a lot of kids who were hot to it was the perfect way to cool off. 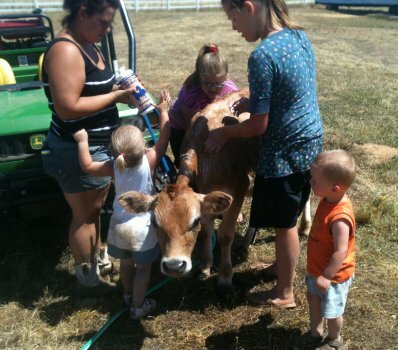 Parcy enjoyed his bath and the kids had a lot of fun. Ace’s new mom and dad came out to spend some time with him, he is so beautiful! He was a very good boy and they really fell head over heels for him. Olive’s new mom came out to be with her today too. She just can’t wait to be able to adopt her and take her home. 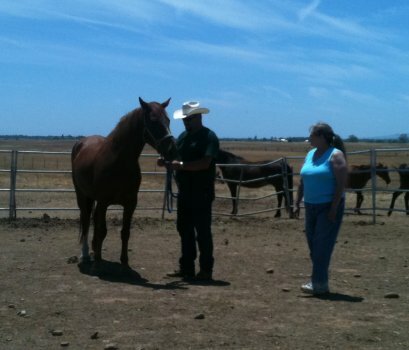 One of our previous adopters came by, they are looking to add another horse to their family. 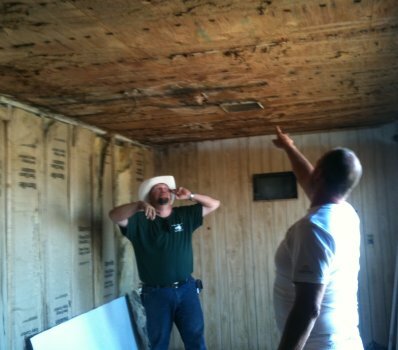 He is a contractor, and Larry asked if he would be able to help with the office trailer, if he had any scraps laying around that he could donate and put them up to make it look better. He was more than happy to offer his time and any items he could find. This is such a huge blessing! Larry and Alex gutted it out and it had been sitting ever since we didn’t have the time or materials to get it put back together. The med room is painted, but the office area hadn’t been tackled yet. He made a list of what is needed. THANK YOU! It is really nice having lots of water. 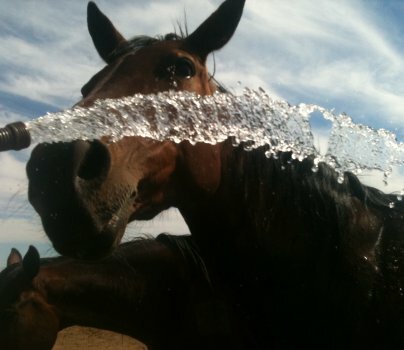 The horses enjoy standing by the fence and getting sprayed off while the water troughs are being filled. Now the hard part of the day came. 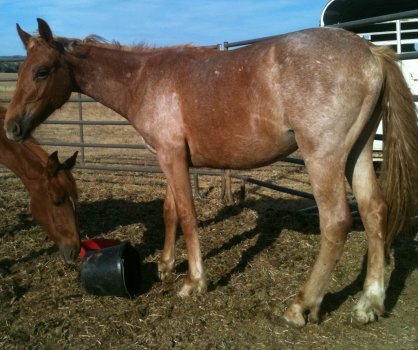 Tawnee had been in communication with the same killer buyer who brought the 4 horses a few weeks ago. 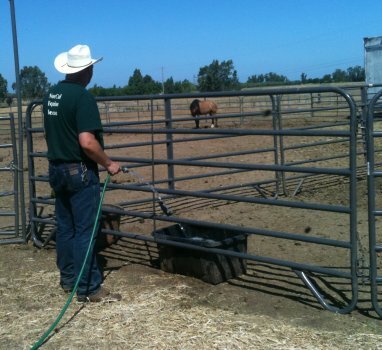 He was heading down south to a staging area for horses being sent to slaughter. He said he could bring some horses back to the rescue if we could pay him $100 each for them. 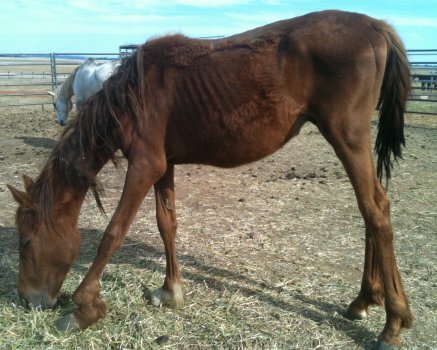 The rescue only had cash for 3-4 horses. He asked if we could do 6. Tawnee said she would see what she could pull together, and he said he would be there on Sunday. When the trailer pulled up it was loaded with horses. He backed up to the round pen to unload. When the door opened Tawnee had to look away. There was a poor horse down in the cram packed full trailer. Then the KB said that there was a goat in there too. The horses started unloading. It was just heart wrenching. He brought back 7 horses, which Tawnee found the money to pay for. He wanted $50 for the goat, but we had no money for her, but April couldn’t let the goat stay with the KB, so she bought the poor goat. 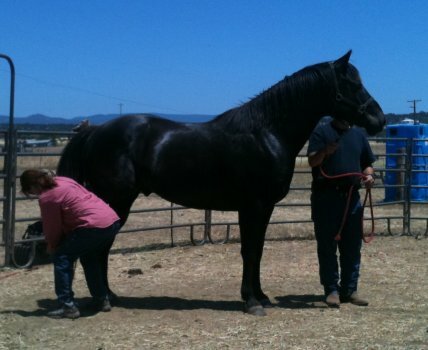 The first horse is a beautiful 2 year old filly who was at the staging area waiting to be sent to slaughter. While she was waiting, people had fun at her expense by roping her mexican style, around the legs. 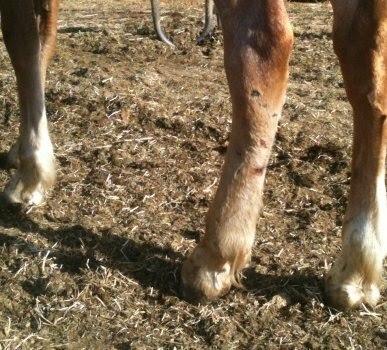 Her legs are swollen and have rope burns. 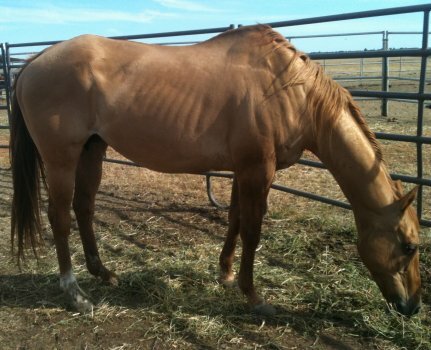 The 2nd horse is one of 3 horses that were dropped off at the staging area, they were on their way from Washington to Mexico, and were unloaded off a double decker because they were too weak to make the final leg of the trip to slaughter. This poor baby broke his leg at one time and it was clearly never treated. It healed up all wrong. 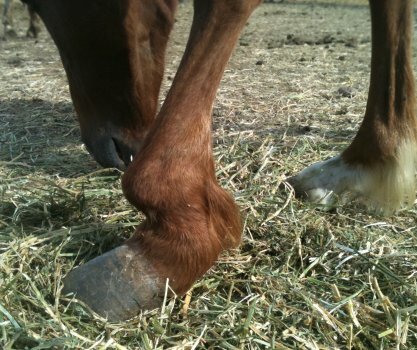 From his hoof growth you can tell he has been in this condition for awhile. Every step he takes you can see pain fill his eyes. 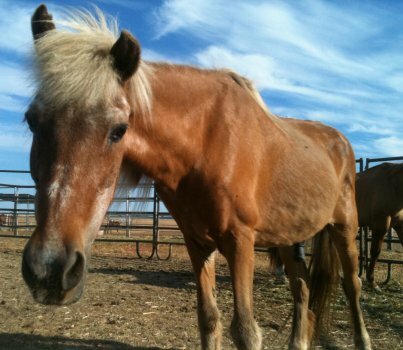 Next is a old pony, no doubt he has given hundreds of children rides on his back, and when he was old, his life was thrown away. 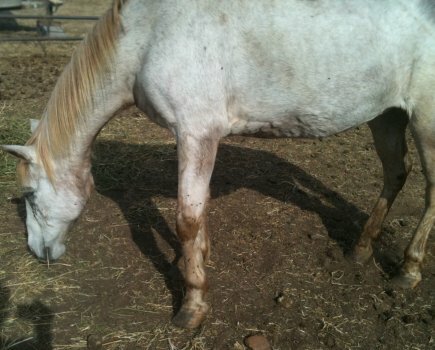 This mare was foundered and we are not sure how severely foundered she is. 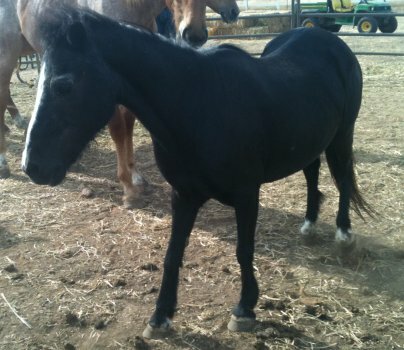 Another little pony, she is older and a little wild. 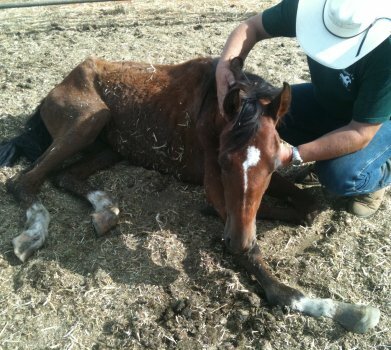 This is another one of the horses that was dropped off at the staging area. She is completely blind, both of her eyes are gone. 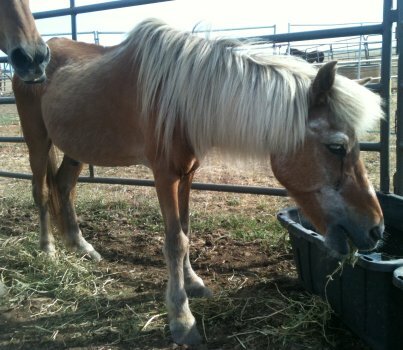 It is so sad that she had to be put in a double decker crammed full of other horses. It must have been terrorizing for her. Flies were swarming her face and eye sockets. She put her face up to Tawnee’s face, and sat there for awhile. 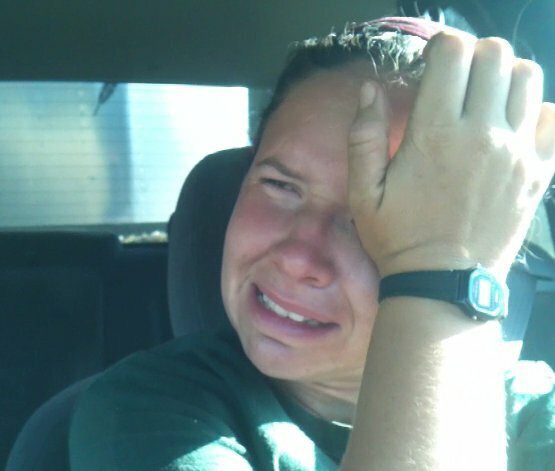 Tawnee told her that everything would be alright now, as she was trying to hold back the tears. The poor little guy got up, and then everyone could see how crippled he was. He could barely walk. Every step was agony on his poor twisted leg. It wasn’t long before he was back down, the poor little guy is so emaciated. What a terrible life he had been living! He was all bones. It was so hard to see. At first he was scared when Larry approached, but soon he realized that he was in a better place, a place where people would not kick him, electrocute him, do what they could to get him to load into trailers for rides from place to place. Now he was at a place where people cared about him. 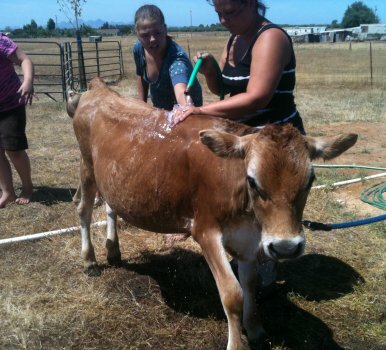 Everyone at the rescue was having a hard time keeping it together emotionally. Larry gently stroked his face as little eyes that had been so fearful softened with peace. There was only one name that could be given this precious boy: Dano. Dano is Spanish for “hurt” and not was Dano hurt, but his abuse brought hurt to everyones hearts. Dano’s poor little leg was so mangled, so twisted and deformed. 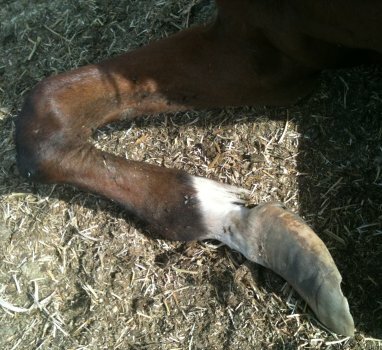 The length of his hoof told us he has been suffering in this condition for a long time. His teeth told us that he was about a year and a half old. 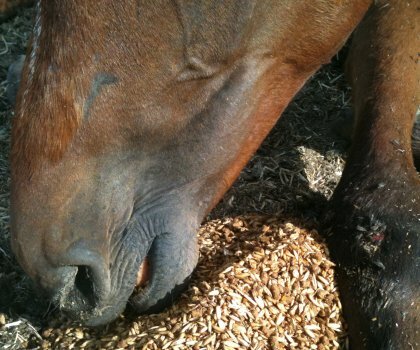 We wanted to make him as comfortable as possible and get him some yummy sweet feed. He really enjoyed it and you could see that he knew his troubles were over. 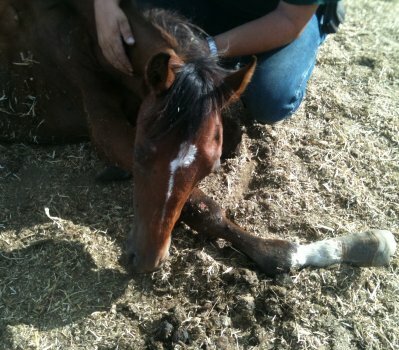 He was dehydrated, had a runny nose, fever, and was in a lot of pain. 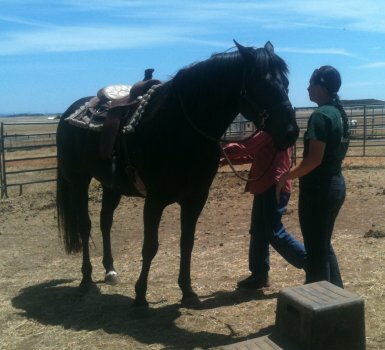 Tawnee sedated him to ease him from his suffering and make him more comfortable. There was so little life left in this precious boy that he simply fell asleep forever, for the first time in his life knowing love and compassion. The first time he knew someone cared. That is all he was staying alive for, hanging onto the thread of life, hoping to meet someone nice before his suffering ended. Everyone’s hearts were broken. This had been one of the toughest things ever to have to go through. Knowing he was no longer in pain and he knew love was all they could take to heart. It’s hard to imagine that this poor goat was in the trailer crowded full of horses. It’s a wonder she is still alive. Thank you April for saving her life! The other horses were settling in and getting comfortable. 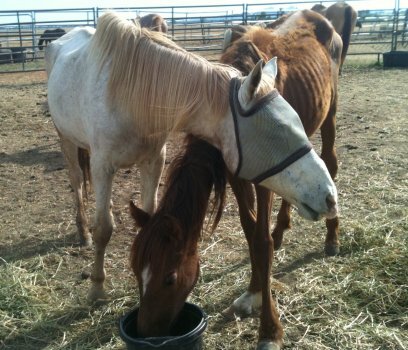 They were really beginning to enjoy basic needs that every horse deserves: food and water. 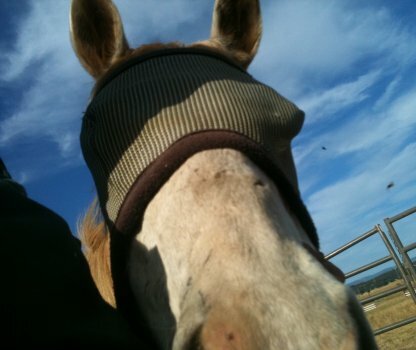 The poor blind girl enjoyed having a fly mask and some medication on her sore skin that was raw from her eye sockets dripping. The older little pony knew that life was looking up too. Looking into these precious faces helped ease the pain that Tawnee, April and Larry were feeling. 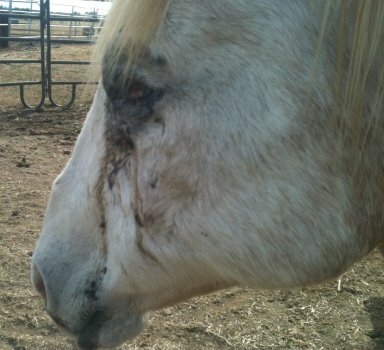 On the way back home after leaving the rescue, Tawnee turned the truck cam on herself. She was frustrated and had to get her frustrations and hurt out. 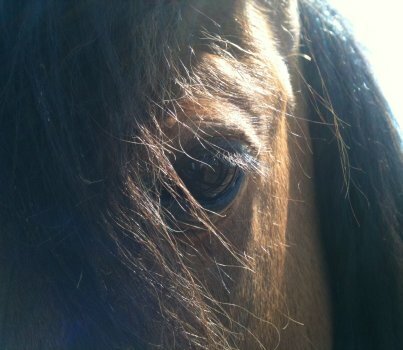 She was a little reluctant to share this, but if it will help wake people up to the suffering that horses go through in the slaughter pipeline, she hopes that it can do some good. To watch the video, click here. 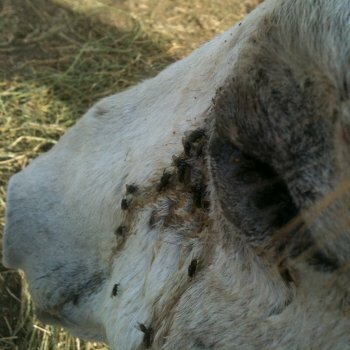 We had to pay $700 to get these horses from the killer buyer, and as you know that is only the start to their care. Any donations are greatly appreciated in honor of Dano. Dano had no reason to suffer, no reason to live an entire life full of agony and abuse because people didn’t care, or worse, people enjoyed making him suffer. 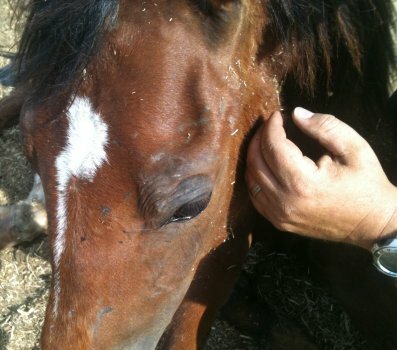 This fund will be used to rescue and care for more horses like Dano. Please donate to Dano’s Fund, click here today. Thank you for posting this beautifully done. I hope it makes a difference too. 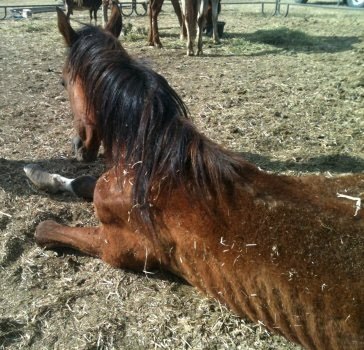 I can’t believe what terrible condition these horses are in, thankfully they ended up with your rescue. This is beyond terrible. I can barely read the words that I am typing through my tears. I am so grateful for this wonderful organization. If you are reading this, then you also care about these beautiful animals. 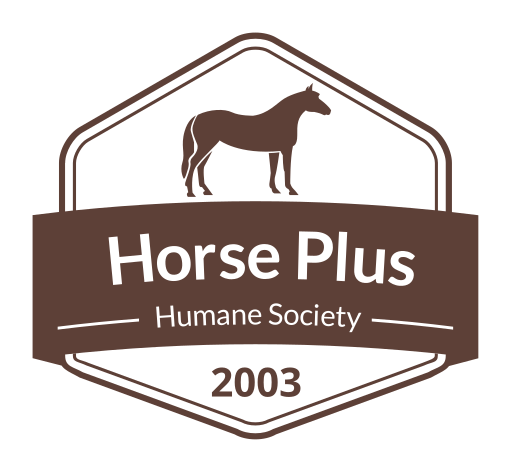 I would encourage everyone to donate to this organization no matter how small the amount. I would never suggest that someone else support an organization if I didn’t donate as well. Tawnee and Jason have proved to me that they are trustworthy with the money I have donated. PLEASE stay strong and continue the work that the rest of us can not. I will pray for you. OMG…I an crying with ya!!! What a horrible situation; but a blessing for those babies in disguise. If that SOB KB hadn’t wanted to make money off you he would have passed you up; instead he saw an oportunity to make a few bucks. But God works in strange ways and brought those babies to you knowing that they would be comforted and loved in their misery. I am so distressed and upset to see this but so relieved that they ended up at your doorstep. 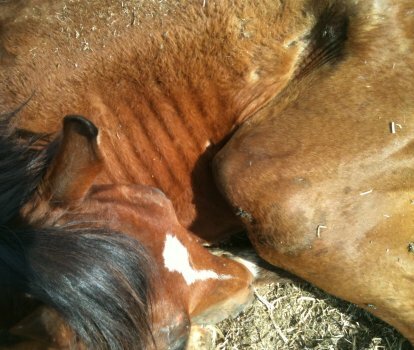 Dano and the other foal are in very bad shape and need to cross over; at least they knew a tender touch and a kind word at the end. And for the others; hopefully their recovery will be good and they will find loving homes they deserve. There were probably a lot of tears shed reading todays blog. I was definatley one of them. These people will have to answer to their maker one of these days for their brutal and horrific actions taken upon these creatures. It gives me and I am sure everyone peace to know that you are able to releive so many of these animals of there suffering and give them their dignity back and send them to a kinder place where they will only know love. If only we could all be more like animals what a better place this world would be. One of forgivness and love from the inside and not outside appearances. God bless you Tawnee and Jason for all that you give and do. Their is a wonderful life awaiting you on the other side when your work is finished here. OMG…I an crying with ya!!! What a horrible situation; but a blessing for those babies in disguise. If the KB hadn’t wanted to make money off you he would have passed you up; instead he saw an oportunity to make a few bucks. But God works in strange ways (you gotta love it) and brought those babies to you knowing that they would be comforted and totally loved in their misery. I am so distressed and upset to see this but so relieved that they ended up at your doorstep. 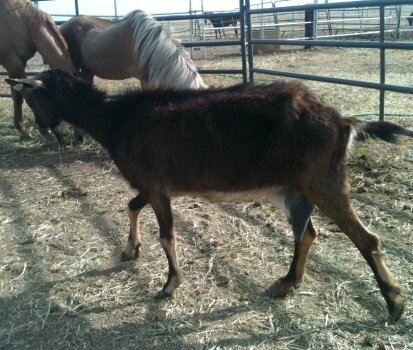 Dano and the other foal are in very bad shape. It was so sad to hear that little Dano just curled up and died he was ready to cross over; at least they knew a tender touch and a kind word at the end. And for the others; hopefully their recovery will be good and they will find loving homes they deserve. What about the other crippled little yearling? It is said that a long time ago, a Mahayana Buddhist master was teaching about bodhicitta (the purified and fully developed heart-mind) in ancient India, when his words were interrupted by the barking of a dog. The loud insistent barking so annoyed one man in the crowd that he threw a rock at the dog, striking him on the left side. At that instant, the master fell to the ground and cried out in pain. Later, when his worried disciples asked what had happened, they saw that on the teacher’s left side there was a large bruise. The dog’s pain had so touched this teacher’s noble and tender heart that it became his pain. 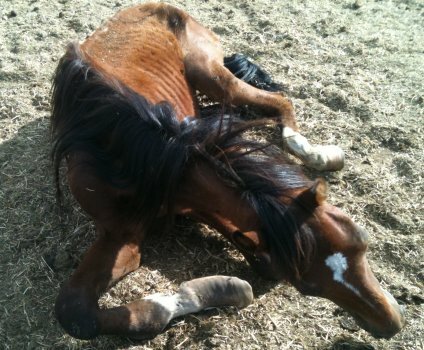 How sad that these horses were in the condition that they were. And then to be on a double decker truck heading for Mexico? THANK YOU for saving them. What a sad story. I have posted a link to it on my blog so that others will know. I’m ashamed that our state officials do NOTHING about horses on these trailers! I actually saw a double decker loaded with horses one time on the freeway in Reno. I had to pull over and cry and scream and yell. It was going the other way or I would have got its DOT number. Dano’s story is heartbreaking — Dano’s Fund link is broken please correct your webpage so we can donate. Thank you for sharing this heartbreaking post and pictures. The worst part is this sort of thing is going on week in and week out at livestock auctions all over the U.S. I hope we humans never, ever get used to seeing suffering like that. God bless you all, you ARE making a difference, more than you know.